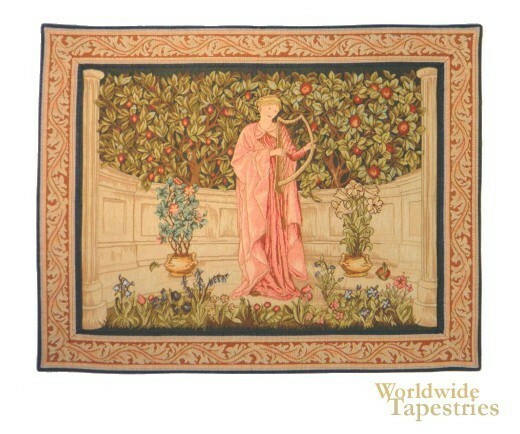 “The Minstrel” is based on the design by Morris and Co in 1899, and depicts a minstrel playing the lute in a garden alcove. The trees are bursting with green foliage and fruit just beyond the marble walls. This vegetation is continued in the middle part of the tapestry as well as the foreground. It is a beautiful scene filled with great detail, a trademark of Morris & Co’s work during this period of great artistry and fine weaving in the Victorian age. “The Minstrel” is lined and comes with a tunnel for easy hanging and display. Dimensions: W 42" x H 32"